My fellow students of shadow, please feel free to follow along with me on this post as we review warlock Tmog gear and review unbearably sad horrible shots of those who are lowering the bar in warlock stature. Remember, it’s up to all of us to represent warlocks to the best of our abilities. We’re at the top of the food chain in WoW so let’s act like it please. I know, people want to “Ooh” and “Aah” over plate gear all day long; however, our goal should make other players flee from our imposing sight without having to cast FEAR. 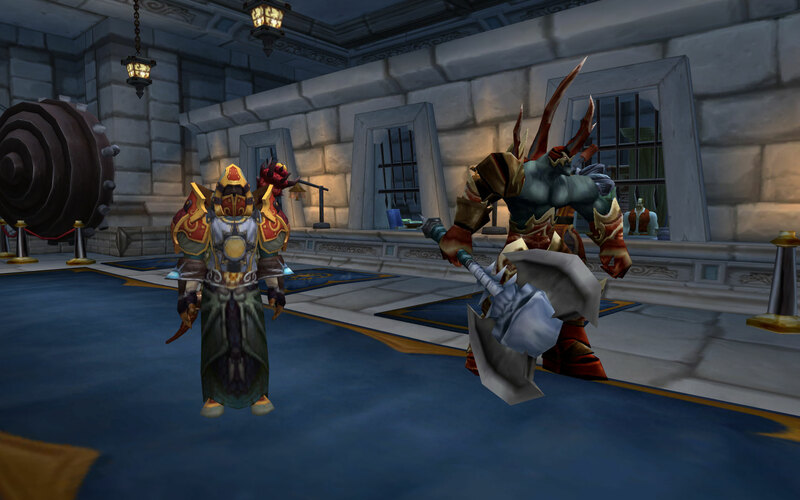 Since I focused on the horde side during my last WNTWFW (What Not to Wear For Warlocks) post, this time I went Alliance to poke fun of review what others might be sporting when dressing to impress. Can someone please tell me the look or evil mood he is trying to capture? At first, I gave him the benefit of doubt and thought maybe he was trying to match his Felguard in some way. Then, common sense told me I was being too nice and smacked me in the back of the head. Omg, this pic smites mine eyes! He’s got some badge gear so it’s not like he doesn’t have a some gold stashed somewhere to use for Tmog. Orange, grey, green and brown – Sorry my friend, this does not bode well at all. The only things I like are his staff, the Felguard, and remembering how clean the SW banks appear. Don’t you think maybe he should borrow that vest and shirt from the bank teller behind him because it would go much better with his helm and shoulders? Ugh, please don’t go out in public if you’re dressed like this warlock. Stay in the bowels of the Slaughtered Lamb until your bank-alt can mail you a matching set of greens to use until you can find a more appealing look. For this clown warlock player, I’d recommend going back to the basics. Stick with black, light black or black when it comes to colors. No exception! If he does continue to walk around looking like this, my only hope would be that he dismissed his minion and told people he was a Spriest. Good idea leaving the Show Helmet option selected. It’s probably better if people didn’t recognize you. Does this worgen look like the epitome of gloom and doom? Or should he parked in front of a tent at the DMF collecting ticket stubs? You’re not some Spriest with long white shoulder pads and you’re not a mage wearing an “I-dunno-where-this-ugly-cloth-dropped-in-the-Burning-Crusade-Expansion-so-I-thought-should-wear-it-dress”. Your goal should be to look like evil incarnate. Your presence should strike fear in your enemies. I’m sure you’ve used your Fear spell, so I know you have a sense for what it can do. Like our human friend above, stick with the basics. The only color you know from now on is black. That’s it. After your fashion sense becomes better skilled then you can blend black with maybe a few items. Until then, you’re only allowed to use any black item that has spikes, skulls, or fire on it. If the Tmog gougers on the AH are being particularly ruthless and you can’t afford a good Tmog set, then please go farm some badges and invest in a cheap PvP set (yes, get the entire set) to use instead. You have an image for both Worgen and warlocks to uphold. Make us proud and don’t ever appear in public like this again! Ever! Sorry all, just give me a second to regain my sanity composure. (/em Amijade holds breath and counts to ten slowly) I apologize for the outburst, but I can’t help in getting passionate about Tmog and why you should do it right when you’re a warlock. Is Transmogging really that hard to do? No, it’s not. If you’re not going to uphold the warlock code and pride then please, for the love of all Hellfire and Fel energy, go roll another toon. Okay, now that my rant is over let’s move on. This gnome is at least trying to make a difference with Tmog! Now, I’m sure you can see the items this Gnome warlock is wearing are some of the tier and badge pieces and that’s fine. He’s so close to a great look, yet he is still far away. There are only two things wrong with this Munchkin’s Gnome’s Tmog set. First, he isn’t showing his helmet. 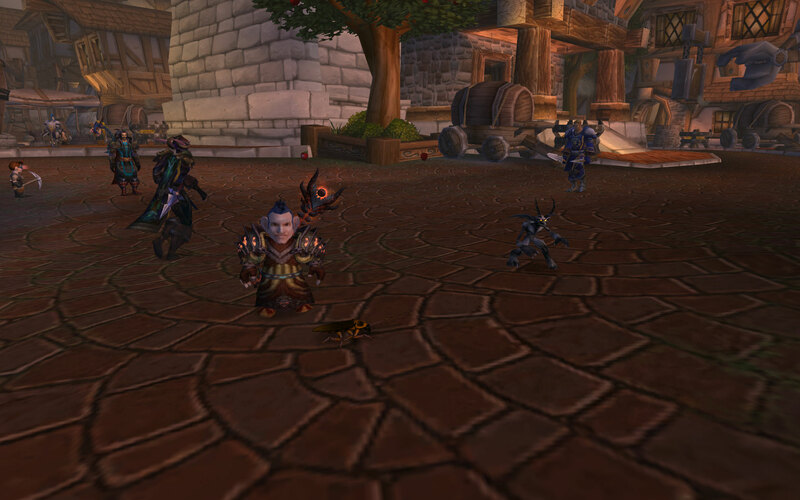 As you know, both gnomes and goblins (but particularly gnomes) should always leave the Show Helm option turned on. This isn’t an every now and then rule, or a whenever you feel like it rule… it’s an all-the-time rule. His failure at not wearing his helm also caused his second problem. The belt alone doesn’t match the rest of the gear. Sadly, he was actually wearing the correct matching helmet and chose not to display it. Showing the helmet would’ve tied the belt, and the outfit together the way the Blizzard developers had planned. I will give him a nice /nod of respect because he did have a Cockroach vanity pet summoned instead of a Singing Sunflower or some other embarrassing pets no self-respecting ‘lock should ever be seen using. It was a good choice due to it’s smaller size and it at least goes with his outfit! I feel sorry for Gnomes with their vanity pets out because most of the tiny pets are taller than them and that can’t be good for one’s ego. What will happen when pet battles come into play and a good size pet might take them out? Maybe Gnomes should hide now for the sake of safety and for preserving their race? However, I will say it’s a very good start my little Gnome friend. Keep striving for greatness and one day you’ll get there. Now, go to your Interface menu and select the Show Helm option and please forget you ever learned how to turn that option off. Tyvm! Finally, I got some hope on my travels because I got lucky and found this guy below. It was late and I almost logged off just as he strode by me. Although his set is mixed and matched from several different green quality item sets, it looks great. It was very distinct and shows his personality off quite well. As you can see he’s an engineer and he really liked the red goggles despite the fact that they didn’t match the rest of his Tmog. However, the staff he chose tied everything together nicely including the goggles. This is a great example of a simple Tmog set that sets a mood and shows others you care about your toon, and that you mean business when it comes to anything you do in-game. 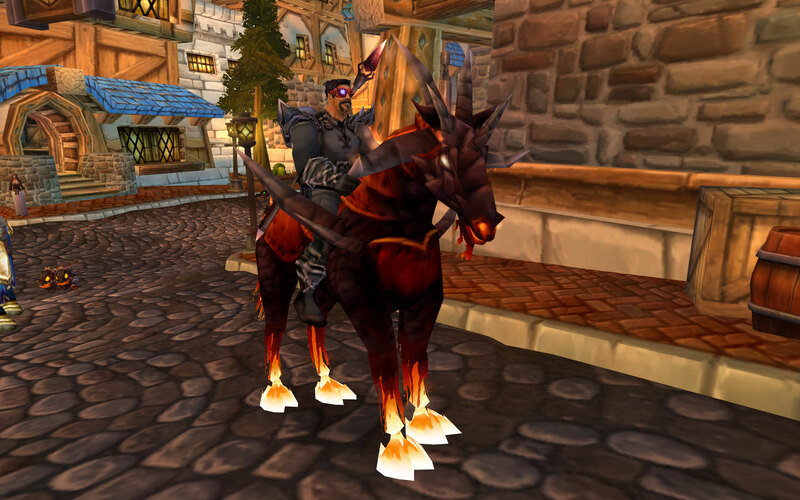 If you were on a PvP field, would you rather have to face this guy or the two failed jokers the worgen and the guy in the AH players we reviewed above? If this guy cares this much about how good he looks in Tmog, then we can be sure he cares about his class and how well he plays it. Trust me, people will be wary and avoid him based on this Tmog set alone. Take 30 seconds and look at this next screenshot. Then read on so we can compare our notes on what this warlock did right and what they did wrong. I found this Gnome sitting near the fountain between the SW bank and AH. As you can he has the start of a unique and creative look utilizing this PvP set for Tmog. Being a funny looking Munchkin Gnome, he’s got his helmet on and he has all of the matching pieces to the entire set. It’s not bad, and clearly shows that he’s thinking about playing our class. However, it falls short in two areas. First, his weapon of choice doesn’t match or look good with the set. While it’s a cool looking staff, it doesn’t make the rest of his gear or the weapon stand out. 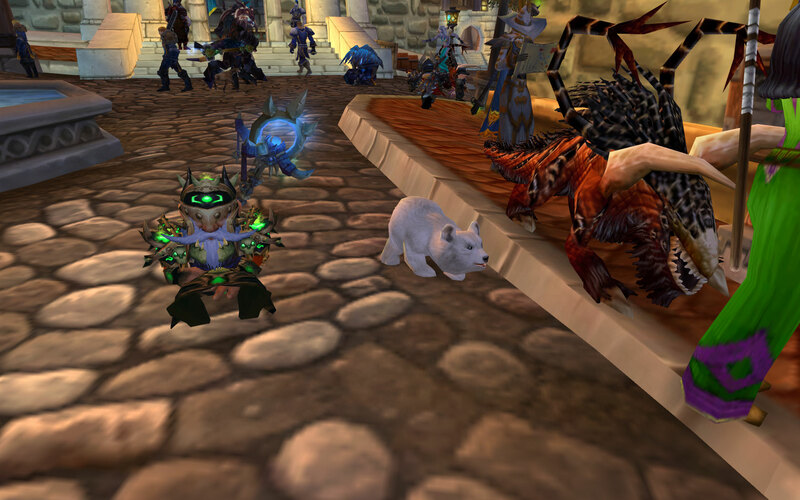 Second, the notorious image of a warlock is ruined by the fact that he’s got his baby Polar Bear vanity pet out. You cannot strike fear in an enemy of you have a cute little waddling cub by your side. It even appears as if the poor cub is lost following the Felhound around as if it were his long-lost mother. Trust me, you cannot cackle laugh in a menacing way with a Polar Bear Cub by your side. It just won’t happen because what you think would be a memorable cackle laugh would actually be interpreted by your foe as someone who isn’t right in the head. I’m really going to miss the Soul Harvest spell in MoP :( Despite that fact, I hope you’re excited because the new expansion is almost here. Representing the true nature of darkness and Fel flame should always be your goal for your Tmog look! I was by your site and saw your fall from the mushroom. What’s a small repair bill for so much fun, eh? Since you are a healer in-game and IRL…I knew you could handle any injury so I wasn’t worried. If you’re refering to the pink and pastel colors I often see mages wearing, please feel free to call yourselves fashionistas or divas all you like. I have absolutely no problem with that and I tend to agree with the definition. Btw, you might have some tough work on the learning curve ahead of you come MoP. Didn’t you see the newest Bluepost? While Fire and Frost will remain with the standard two-button rotation, I believe Arcane will now require a third spell. You may have heard of it because it’s called a Hearthstone. 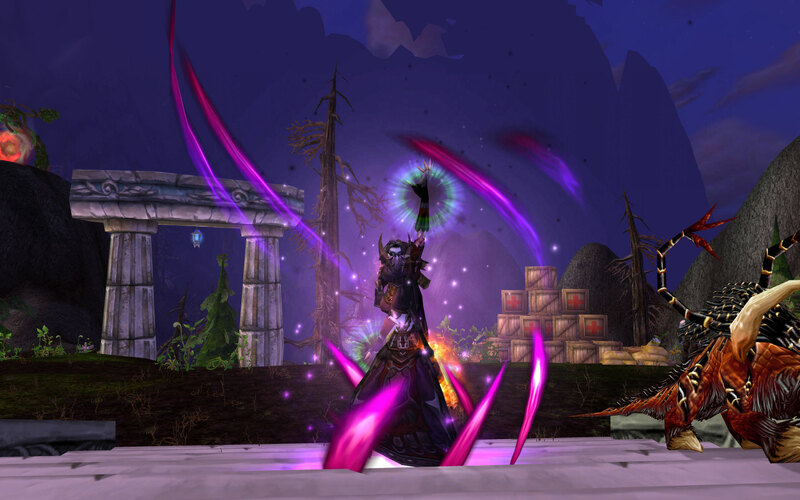 While it doesn’t improve your Dps, it will provide mages with an “Oh Crap!” button for an escape in PvP. OMG! Thankfully you can’t see my two Warlocks. Their lazy handler only dresses them up in MogIt. But I have learned, I have now expressly forbidden absolutely ALL use of cute cuddly pets. Skulls, snakes and roaches allowed only! Why do I believe you’re teasing me? You haven’t mogged your ‘locks? Psh! I’ve seen pics of your hunter and I’m sure you put just as much care in your warlocks and the way they look as well. BTW, I feel bad. I’ve been reading some of your posts and I meant to comment on the one where you said something about a “Donkey violating…erm…(you know)” omg! You had me cracking up. No worries, because I’ve felt the same way about some peeps in LFG when I heal. I hope you’re doing well and thanks for stopping by as always! 6 days till patch! Then less than 1 month for MoP! I can’t wait. Oh please continue this as a series. Heck, once the Mogolympics is over I might borrow from this idea. 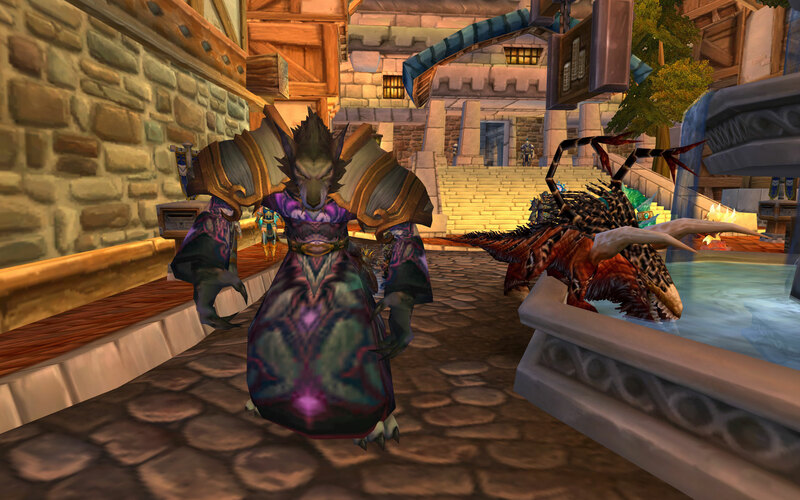 As for my own Warlocks, sadly there is only one…Vortmar of Kirin Tor. When you realize he’s actually a mad scientist who somehow managed to summon demons with one of his crazy inventions, he’s not so bad. I hope you’re well and thanks for stopping by! TMogging’s fun if not a huge gold sink :) tbh, I’ve narrowed my overflowing bank space down to four sets :) I’m not sure if you saw Saga’s post on the new gear sets or not. I’m sure you’ll like them as much as I do. They actually have the dark warlock flavor we all love. Ugh! Sorry Elk, I keep responding to this comment but WordPress isn’t posting it? Grrrrr! I love your blog overall and great job but it’s difficult to take some of it seriously with your blatant bias towards belfs/humans. People are into all kinds of stuff, so saying it’s a *must* to wear a helm is just inaccurate. It’s your blog, of course and more power to you. It just comes down to whether you want to base your advice on YOUR preference personally or more so on helpful info and facts. Still, great job and I enjoy reading!